I'm sitting in my cluttered room, unpacking my messy suitcase and still messier jetlagged mind, thinking about our more than two weeks in Bali, savoring little memories and wondering how on earth I'm going to tell it all, in what order, how? Oh my good intentions of posting regularly: all dashed by the spottiness of wifi availability and the very real busy-ness of being part of a 25-person group. So I'm sitting here now, after, sipping ginger tea from my Tutmak cup, remembering the much more delicious ginger tea in Bali, but also too fuzzy-headed to drive to the store right now for fresh ginger to make it with... I'm resisting the urge to go to sleep and marvelling at my own absurdity: I honestly thought I would be able to arrive last night close to midnight and go to work today? Absurd. To cheering your evening to the most beautiful and unforgettable moment we will perform you with Balinese legong dance from the community children of the village. And actually, that just about says it all. So much was done to cheer our days and evenings to the most beautiful and unforgettable moment, over and over again. Stacks and stacks of beautiful and unforgettable moments, really -- thanks to scores of graceful and smiling and sweet people devoted to showing us a good time in their home. Yes, of course, we stayed primarily in places designed for our comfort, designed to receive yoga groups and pull out all of the stops, so of course, we had a good time. But it was more than that. I've been other places on retreat, and this was distinctly different. This was Balinese. So many small kindnesses, so many gestures of consideration, all that emphasis on karma expressed in innumerable gentle, caring ways, even in the midst of a market transaction. And sweet. Like the presents we were each given at check-out, incongruously wrapped in Mickey Mouse and Winnie the Pooh paper, souvenirs of Munduk from the good people at Puri Lumbung Cottages. And how enormous the smiles when people said, "You from America? Obama! Indonesian!" The warm welcome: that is an entirely new sensation. I feel completely loved-up. It's great to be back really, inside the home that Joe and I have made, to walk around in our rooms and see the evidence of our well-lived life. 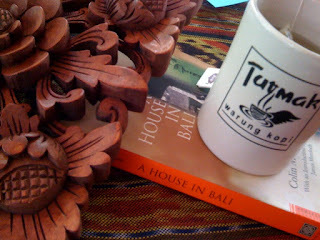 At the same time, a little piece of me is pulled back, tugged back, reminded by carvings and batik, to an island where we were received like family for a few weeks. So sweet to be back and dreaming of return. "Small kindnesses" - thanks for the reminder of how much impact these have. Welcome home!